A while back, I was leafing through a magazine and fell in love with a beautiful ribbon-covered necklace. But it was $49! I just couldn't spend that much money on a few beads and ribbon. Recently, I realized, "I think I can make that" and I did. It's very inexpensive to make. The beads were $3 and I only used about half. The ribbon was $1 and I also only used half of that. The embroidery thread was only 39 cents. That's about $2 for this totally unique necklace. My daughter took this one, so now I need to make one for myself. Source: My inspiration was a necklace I saw years ago and the teething necklaces I've seen on pinterest. 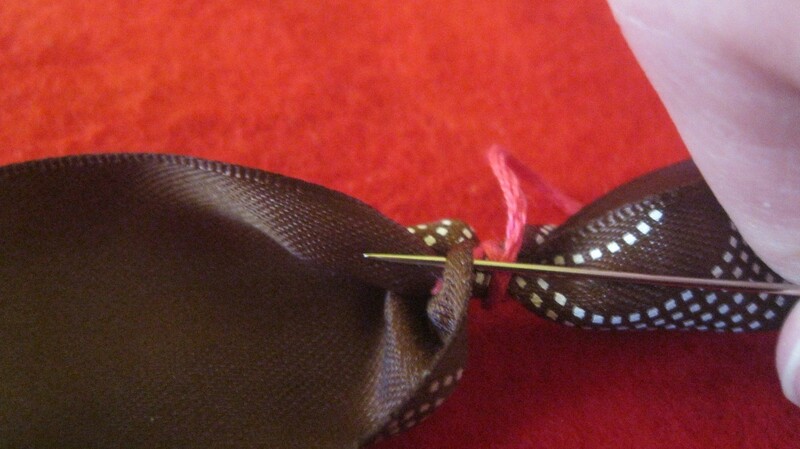 Start by folding your ribbon in half at the end and cut diagonally to the center. It looks fancy this way! Thread your embroidery thread onto your needle. Knot the end. 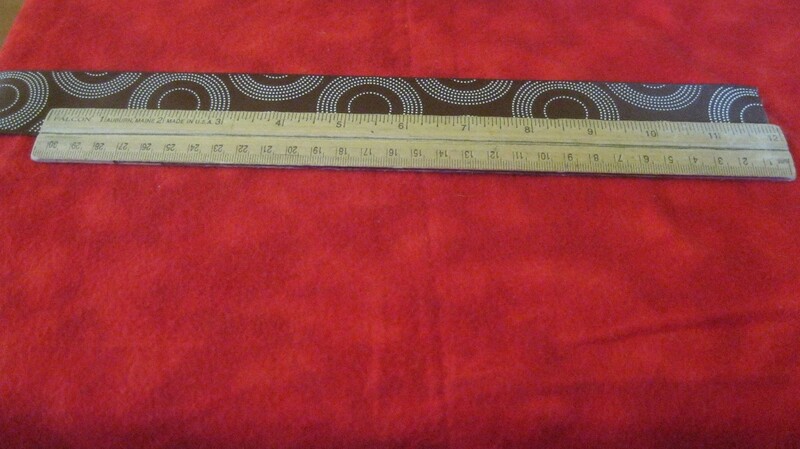 Measure 12 inches from the end of the ribbon. This will be your starting point. 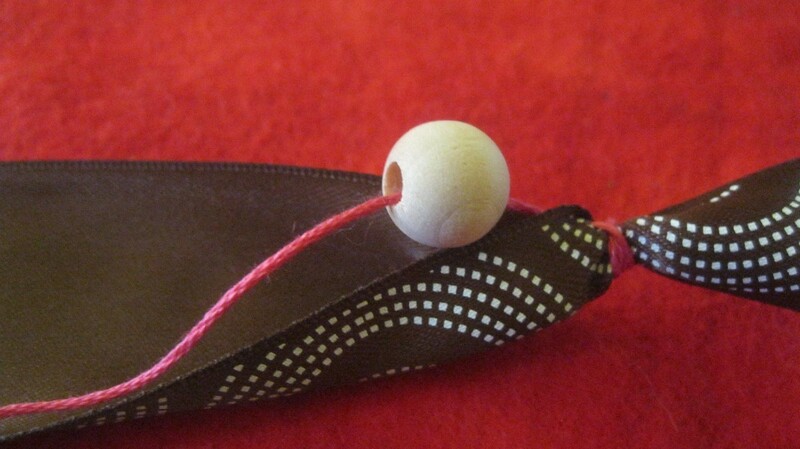 The extra 12 inches of ribbon will be used to make your bow. 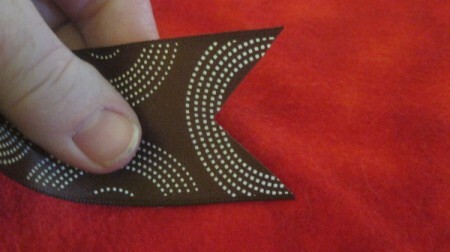 Insert your needle in the inside of the ribbon, close to the edge of one side. 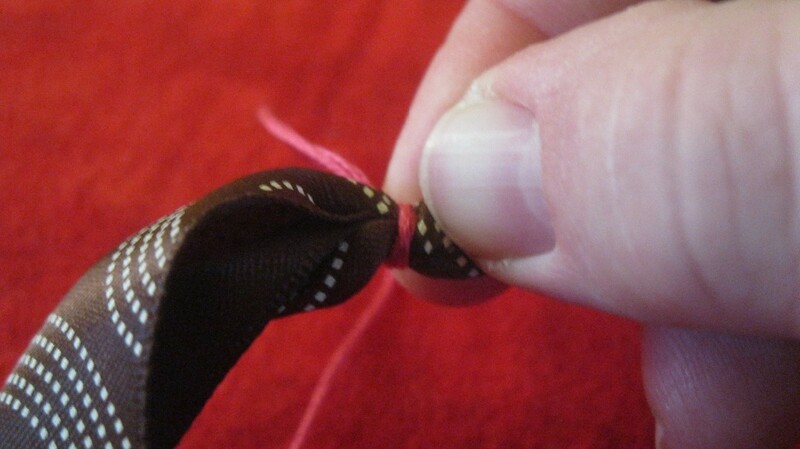 Wrap the thread very tightly around the ribbon, about 4 or 5 times. 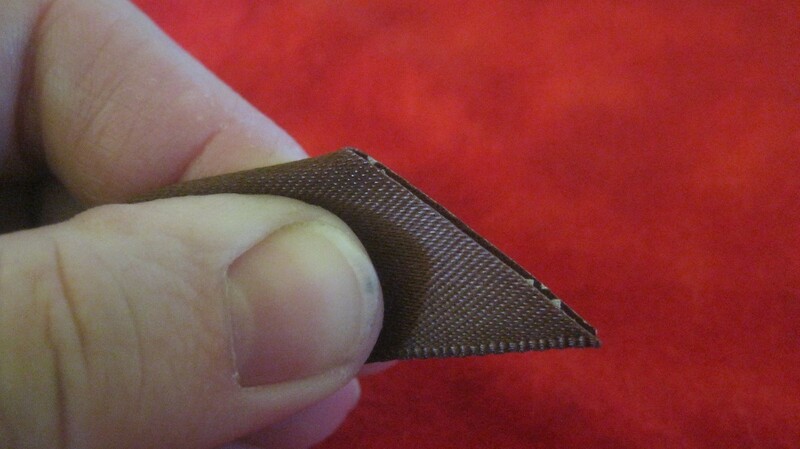 Insert your needle from the outside, going inside, as close to the wrapped area as you can. Put your bead on your thread. Push the bead flush with the closed end, get it nice and cozy in there! Put your needle at the same point as the top of your bead. From the inside of the ribbon, push the needle to the outside. Close the overlapping ribbon over the bead. 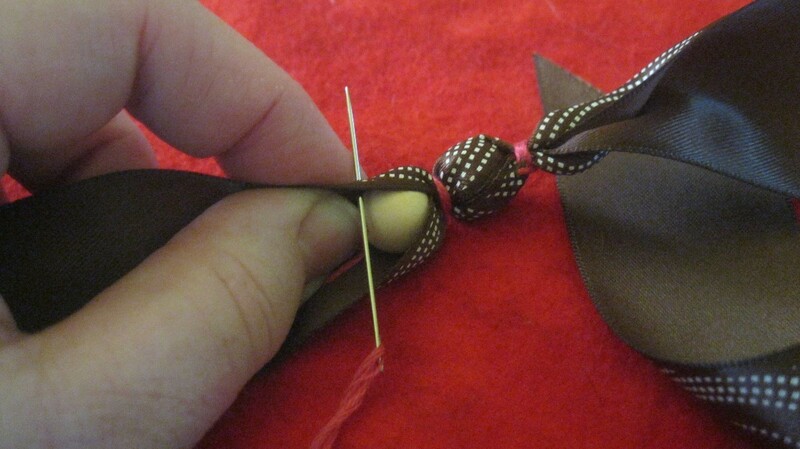 Wrap the thread around the ribbon, enclosing the bead inside, very tightly. I wrapped each one 4 times. 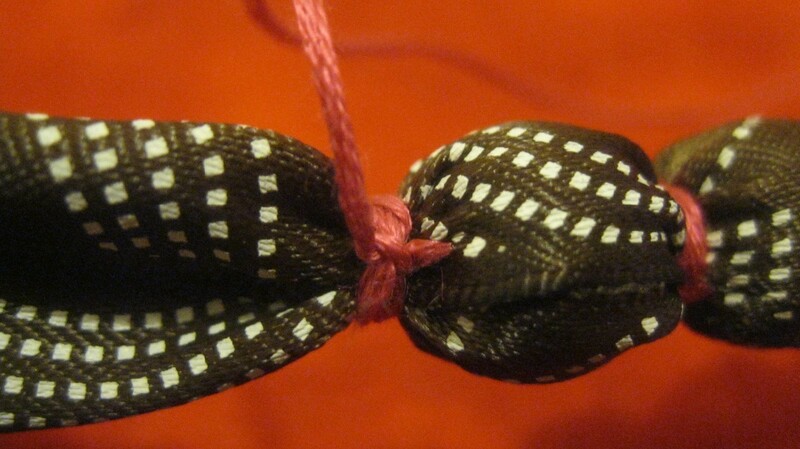 Continue doing this to make your necklace as long as you would like. If you run out of thread, just tie some more on and wrap the tied part between the beads (to avoid seeing loose thread ends). 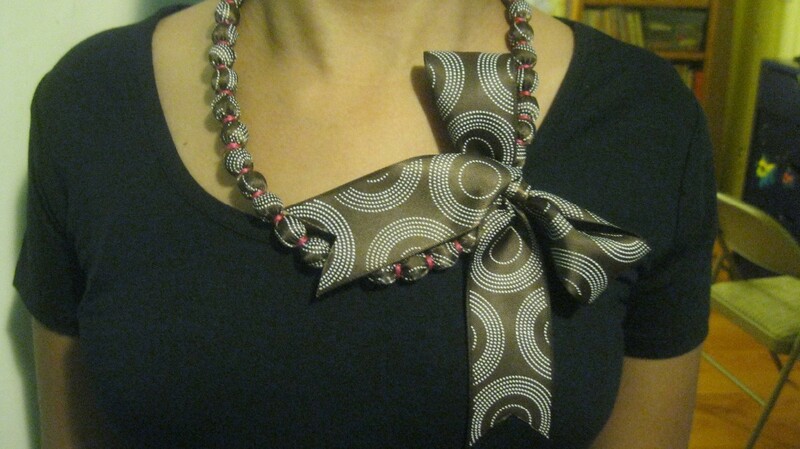 When you have your necklace the length you would like, wrap around the ribbon next to your last bead 4 or 5 times. 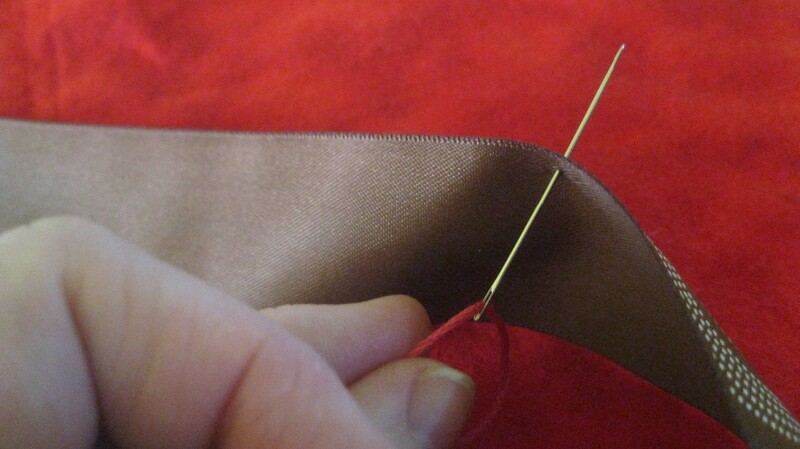 Go under the wrapped thread with your needle a couple of times. 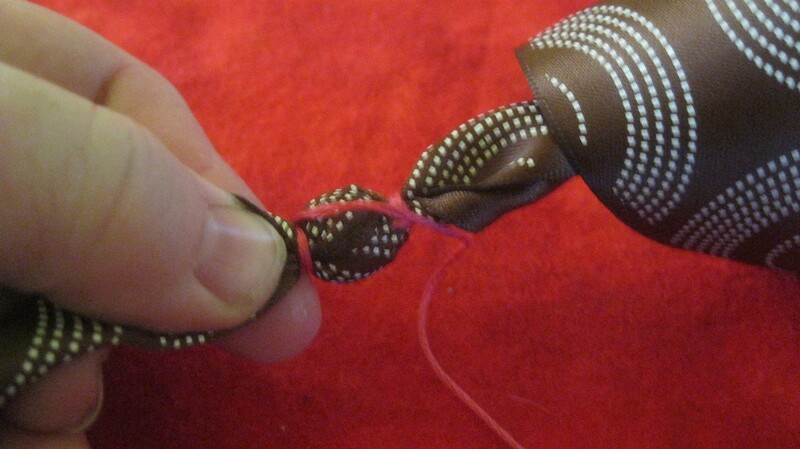 Then knot it, to make sure it doesn't come undone. Cut the ribbon 12 inches from the end of your beads. Cut your end the "fancy way", like you did in the beginning. I think this is such a great idea. I have one question. 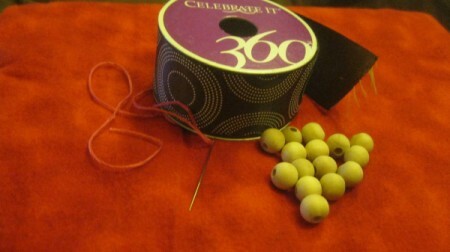 When moving between beads with your thread, do you keep the thread on the outside of the bead or is there some way to hide the thread when moving between beads? In your picture it appears that the thread can be seen. Just wondering. 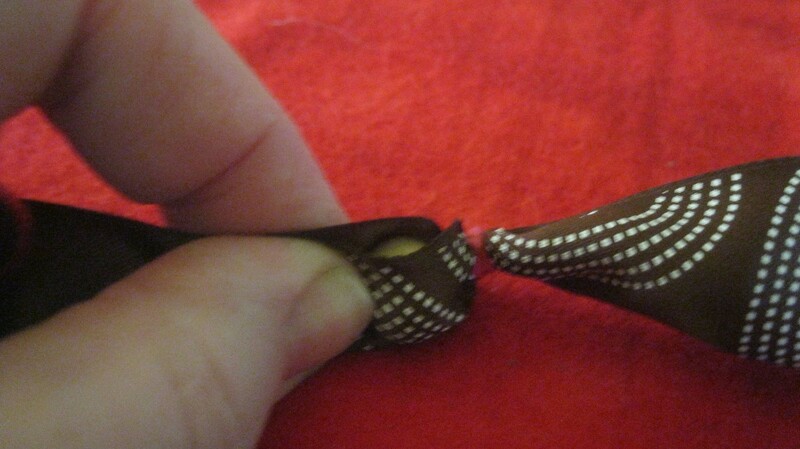 Yes, I wrap the thread around the outside of the ribbon and beads. 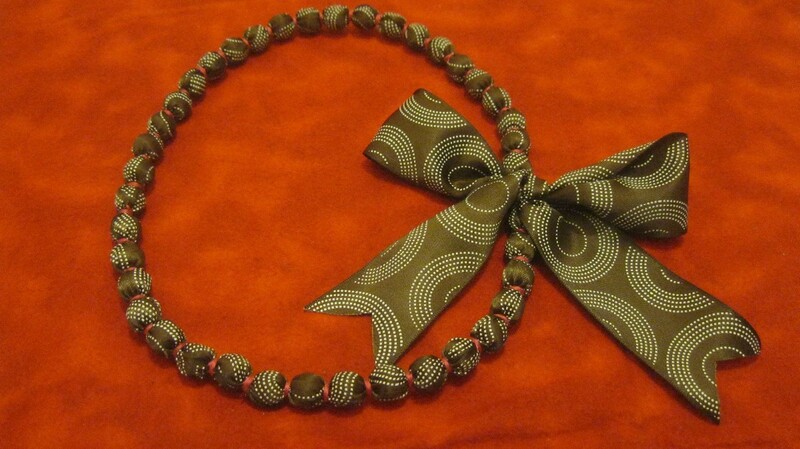 I have seen some people make teething necklaces, where they tie a knot between each bead. 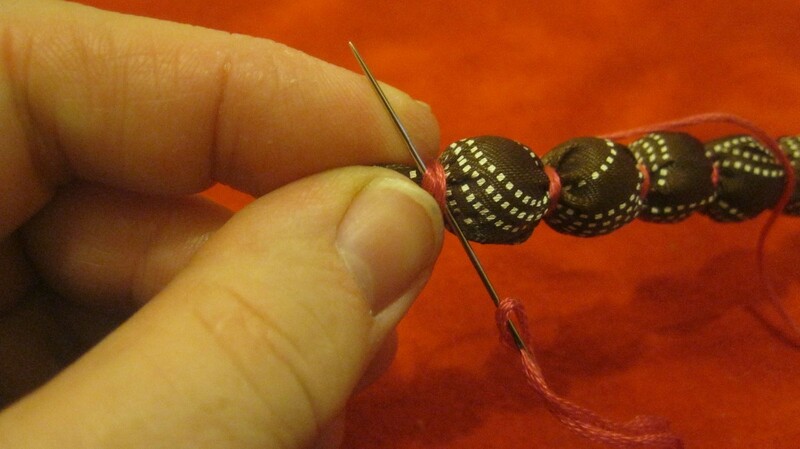 If you didn't want the thread or knots between the beads, you could sew a long sleeve and put the beads in, then close up. Hope that answers your question. Thanks!